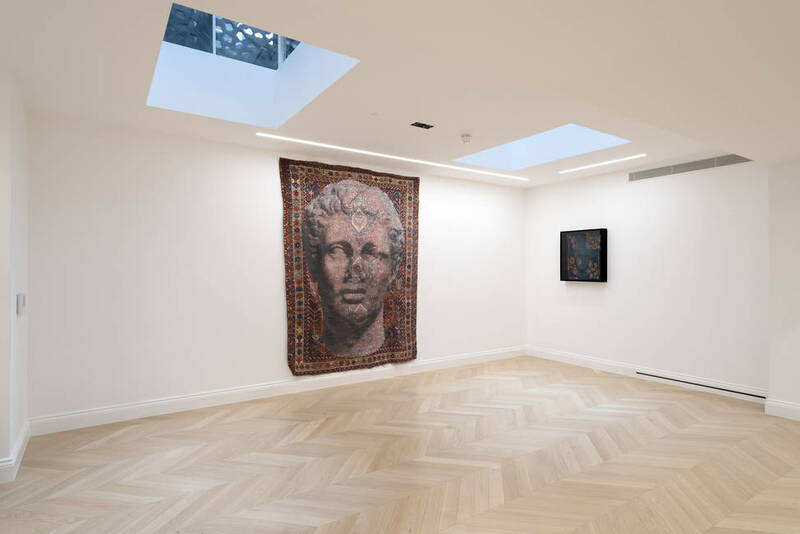 Senesi Contemporanea is pleased to present Luca Pignatelli/Recent Works, an exhibition showcasing recent works by Luca Pignatelli marking the artist’s first solo show in London. 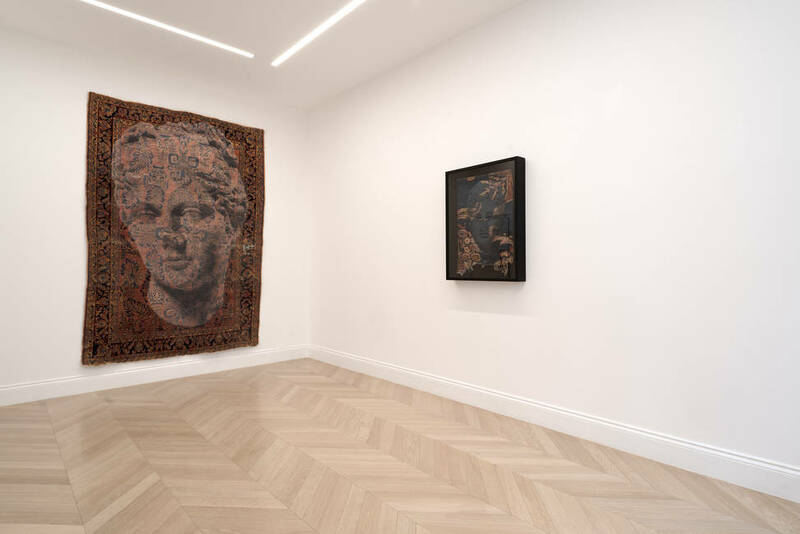 Luca Pignatelli, one of the most interesting and established Italian artists of his generation, is presenting his first solo show in London at Senesi Contemporanea. 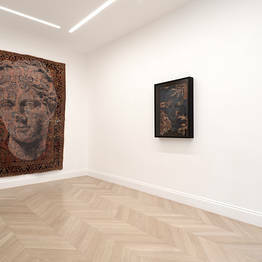 On view is a series of recent works, one of them being Persepolis, an artwork with mixed media on top of an antique Persian rug. One edition was recently shown at Tefaf in Maastricht and is currently on view at the museum MAXXI in Rome. 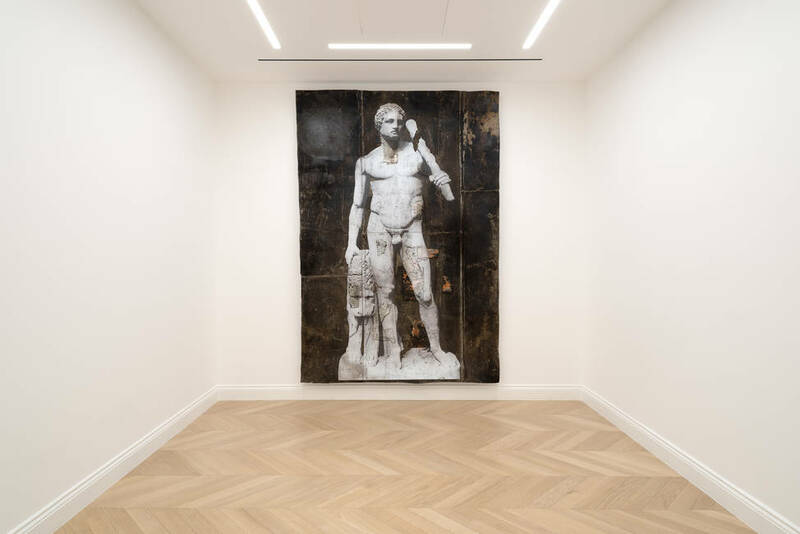 Far from the intention of provocation his recent works follow the course of the aesthetic and lyrical, which the artist from Milan has formulated as a result of his constant confrontation between the contemporary and the antique. 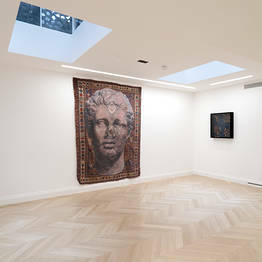 This is primarily the result of the medium the artist uses in his practice and that is highlighted in this particular exhibition- rugs, textiles, iron integrated within the artworks. Working with western iconography from greek mythology to Iranian culture, he has successfully established himself as a contemporary artist without negating the various experiences in art history from the point of view of the technique as well as the subject. His view is that of a poetry which at time is lyrical and analytical, the works aesthetically pleasing, as we recognise the displayed and simultaneously are confused by its variation they dominate; originating from the abstract and material base, to combine and relate the material, Pignatelli generates new and original imagery that strengthens our unconsciousness. “The questions raised by the works of Luca Pignatelli presented in this exhibition are of different kinds. The first relates to the image. 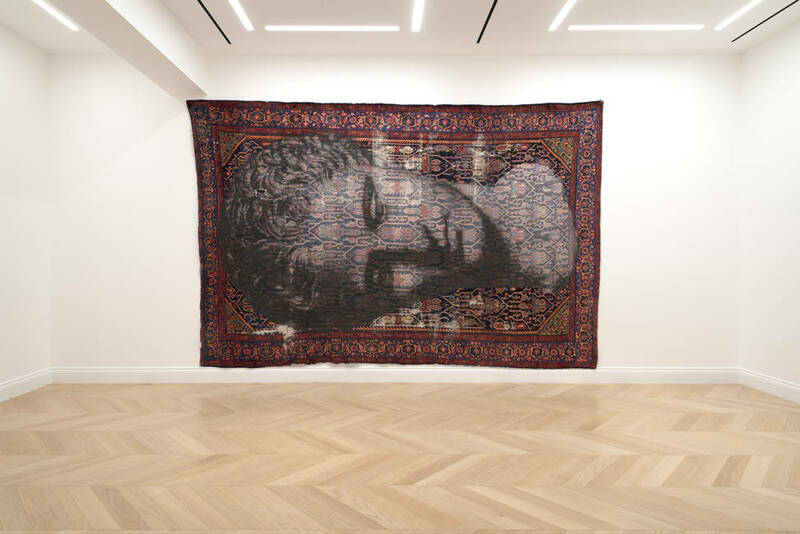 Persepoli is made from a Persian carpet on which the artist has impressed the image of a female head drawn from classical statuary. This is a reference to Western civilisation founded on the primacy of the eye and of the observer. 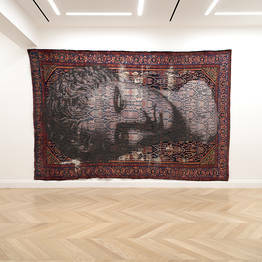 The head is superimposed on the decorative elements of the carpet, and at times appears to vanish among them. We have the impression of seeing these elements simultaneously, but in actual fact we see them in alternate sequence. We have to add to this impression the fact that what we normally see is not reality, because what we perceive " that is the external reality that we become aware of through the senses " is different from what the object represents and is reconstructed by our eyes in the brain. In the case of Persepoli, the procedure is not exactly stratification, where the development of the formal and aesthetic language proceeds by selection, appropriation, additions and montages of images and matter. The procedure is actually layering, produced by the impression of an image on the support. Image and support are overlaid and we perceive them as alternating since comprehension, in the literal sense, continues to be one of the greatest challenges for the human intellect, which cannot contain two dissonant images that it does not experience simultaneously. It is this dissidence that arouses in the observer the " frequently erroneous " need to comprise the information received in a single definition”. Luca Pignatelli was born on the 22nd of June, 1962 in Milan, where he still lives and works. Son of Ercole, an artist himself, after obtaining his high-school diploma, in the early Eighties he enters the Politecnico di Milano, attending the architectural composition courses. The Department of Architecture at that time was entrenched with the intuitions of Aldo Rossi and inspired by the concept of the sedimentary growth of History, which, for Pignatelli, will acquire a special relationship with painting, connecting the artist’s research on Time and Memory. Always aware of the changes that take place among the sceneries of art, painting and architecture, Pignatelli is capable of condensing them into a transversal historical reflection. The City and the History of Art represent for the artist a sort of permanent setting to human events, but nonetheless a dimension wherewith Pignatelli engages his artistic research, operating analogies, as well as modifications. He is fascinated by anonymous architectures and port cities, with their construction sites and movement of good, encountered during his travels across European cities, by Milan, native city and place of choice, along with New York, where he sojourns for long periods starting from 1986. 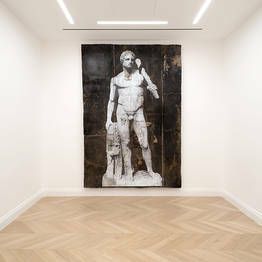 As a painter capable of facing the challenges posed by large scale works, Pignatelli normally utilises recovered and unexpected supports, pictorial in themselves: canvases and tarpaulins, woods and irons, assembled papers onto which he operates applying his selection of images, icons of the collective memory taken from a kind of universally renown repertoire. His work explores images that are often finds of a lofty classical nature but also urban or mountain landscapes, sometimes trains, planes, symbolic elements, employed by the artist to construct and deconstruct a new evocative visual repertoire. 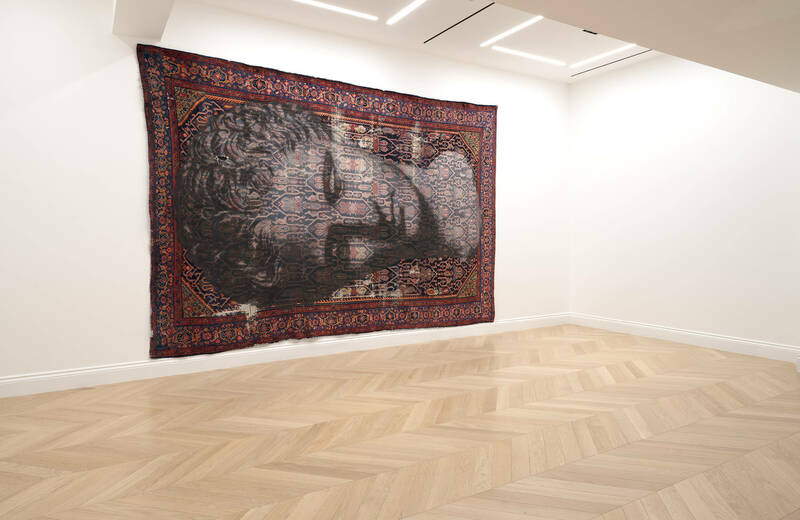 Currently, the Luca Pignatelli’s research focuses on materials and on the aesthetic and conceptual possibilities generated by the superimposition and stratification of different iconographic cultures. 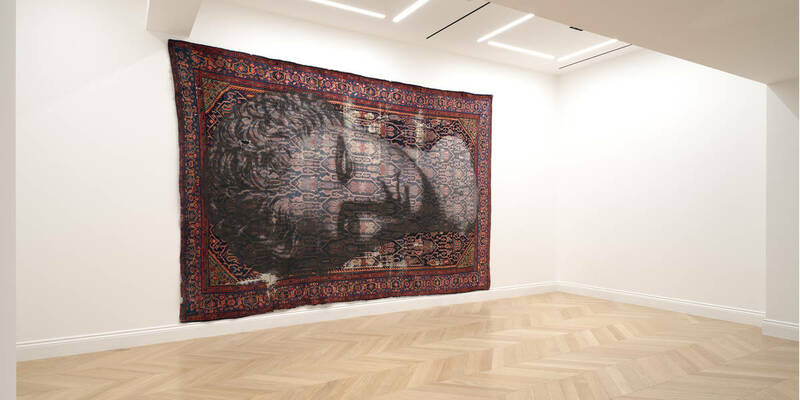 Persepoli represents the most recent outcome of this journey of never-ending experimentation: a cycle of mixed media on antique Persian carpets, created under the intention of integrating distant historical periods, cultures and worlds. Among his most recent solo exhibitions we cite: “Persepoli”, Mosaic Room of the Classense Library, Ravenna, (2018); “Luca Pignatelli”, Galleria Poggiali, Pietrasanta (2018); “Persepoli”, La Fenice theatre, Venice (2017); “Luca Pignatelli”, Cucchiari Palace, Carrara (2017); Uffizi Gallery in Florence (2015); Modern Art gallery " GAM, Turin (2015); Capodimonte Museum, Naples (2014); National Institution for Graphic Art, Rome (2011); Musée d’Art Moderne et Contemporain de Nice " MAMAC, (2009); MANN, National Archeological Museum, Naples (2008); Santa Maria delle Grazie, Milano (2008); India Theatre, Rome (2007); Annex Plus " White Box & Ethan Cohen Fine Arts, New York (2006); Galerie Daniel Templon, Parigi (2005); Generous Miracles Gallery, New York (2004, 2003, 2000); Galleria Thomas Levy, Madrid (2002); Mudima Foundation, Milan (1999); Friedlander Limn Gallery, San Francisco, CA (1999); Leighton House Museum, London (1991). Among his group exhibitions we cite: Work in Progress. San Patrignano Foundation Contemporary Art Collection, La Triennale di Milano and MAXXI Museum in Rome (2018); Mediterraneo. Lo specchio dell’Altro, Royal Palace, Milan (2018); Arte contro la corruzione, Casa Testori, Novate Milanese (2017); Gallerie dell’Accademia, Florence (2014); Palazzo Chiablese, Turin (2014); “Co-existance”, MAXXI Museum in Rome & The Jerusalem Foundation, Tel Aviv (2010); 53rd International Art Biennal Exhibition, Venice (2009); Gino Di Maggio Gallery, Berlin (2004); “New Acquisitions”, Everard Read Gallery, Johannesburg (2004); “Arte è Pace”; 50th International Art Biennal Exhibition, Venice (2003); Palace of the European Parliament, Strasburgo (2003); Académie Royale de Belgique, Bruxelles (2002); Isetan Tokyo Museum, Tokyo (2000); PAC " Contemporary Art Pavilion, Milan (2000); Musée Nicolas Sursock, Beyruth (1997); Musée Pully, Losanna (1996). Pursuant to the requirements set forth by national and European Union law regulating the handling of personal data, this site is in conformity and protects the privacy of both visitors and users.